In our last post, we looked at the early developments in heavy machine guns and the work done by Hiram Maxim. We will continue our studies on this topic today. When we last left off, Hiram Maxim had invented the Maxim gun and had founded a company in England to manufacture them. What was not mentioned in the previous post was that he took on a partner for funding the new Maxim Gun Company. This partner was Albert Vickers, son of Edward Vickers, who was one of the founders of a prosperous steel foundry business and also had interests in manufacturing armor plating and shipbuilding. In 1896, the parent Vickers company bought out the Maxim Gun Company and got into the machine gun manufacturing business as well. Vickers took the basic Maxim gun design and simplified the firing mechanism and also used more modern alloys in the construction, thereby reducing its weight slightly. The Vickers machine gun was formally adopted by the British army in 1912 and was used pretty heavily in World War I, both by the army and the airforce (it was fitted into several British and French fighter aircraft). 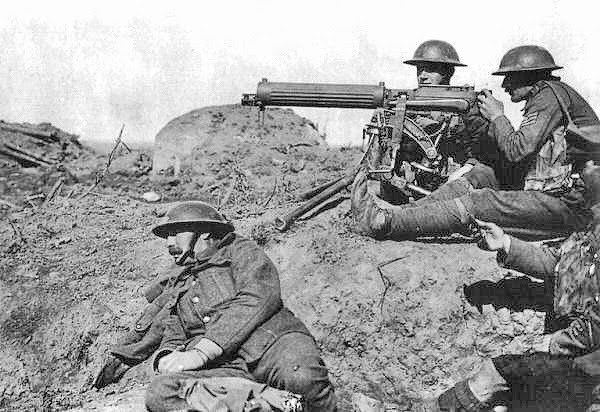 Vickers machine gun in action during World War I. Click on the image to enlarge. Public domain image. Like its predecessor, the Maxim machine gun, the Vickers also has a barrel surrounded by a water jacket, in order to cool down the barrel. Upon firing the barrel rapidly, the water would turn into steam and exit out via a port at the muzzle end, into a separate steam chest. Here, it would condense back into water. This system has the advantage that the rising steam does not give away the gunner's position and the water can be reused. It was recorded that if the water ran out, crews were known to pee into the water jacket. In British use with the .303 cartridge, this weapon has a range of over 4000 meters. The gun weighs about 30 lbs (13.6 kg.) by itself, without any ammunition or water. With a full load of water (about 4 liters) in the water jacket, it weighs about 40 lbs (18 kg.). Then, there is the tripod stand, which weighs about 50 pounds (23 kg.) and the ammunition boxes, which contain 250 cartridges held in a cloth ammunition belt and weigh about 22 lbs (10 kg.) each. In addition to this, the weapon also comes with spare barrels, steam chest, pipes etc. With all this weight, the gun needed about six to eight people in a crew to operate it: one to fire the gun, another to assist with feeding the ammunition and reloading it and the rest to carry the weapon, extra ammunition and spare barrels. If the gun needed to be moved, the crew would disassemble it into lighter component parts, while one of them stood guard with an ordinary rifle. The gun was designed to fire 10,000 rounds per hour, after which the barrel would have to be replaced by a new one. With a trained crew, this barrel replacement operation only took a couple of minutes to accomplish. Therefore, the gun could be used to fire almost continuously for very long periods of time. In August 1916, the British Army's 100th Company of the Machine Gun Corps fired their ten Vickers guns continuously in battle for about 12 hours straight. During this time. they interchanged about 100 barrels and it is recorded that they fired over 1 million cartridges without a single failure! It was during World War I that the classification between heavy machine guns and light machine guns started. Light machine guns like the Lewis gun were issued to normal infantry units. Heavy machine guns like the Vickers were issued to new units called Machine Gun Corps. As the reader can probably see, the differences between the light and heavy machine gun classifications now become clear. Light machine guns are lighter, come with bipods and are designed to fire short bursts of ammunition, whereas heavy machine guns are much heavier, are mounted on tripods or vehicles and can fire on automatic for much longer periods. Light machine guns are issued to advancing infantry units to support an attack, whereas heavy machine guns are more geared towards staying at a fixed position and defending against advancing infantry or cavalry. The Vickers gun was known for reliability and was sold to several countries in a variety of calibers. It was in service with various countries from about 1912 to 1968. Unlike the light machine guns that we studied before, this gun is capable of firing almost continuously, literally for hours. In our next post, we will look at the modern definition of heavy machine guns. Hi, I'm writing a book that is set on a stagecoach ride along the Santa Fe Trail in Kansas in August 1866. There is a guy riding 'shotgun' who uses a double barreled shotgun with 00 buckshot. I want to know how people back then might pronounce it...double-ought or double-oh. I saw you are a historical site so I thought you might be familiar with it. Thanks for any info. Sorry if this is off-topic as I saw no other way to contact you and this was your most recent post.